A fire has broken out at racehorse trainer Luca Cumani's stables in Suffolk. More than 30 firefighters were called to tackle the blaze at Bedford House, Newmarket, after it started at about 10:30 BST. Stable hands are said to have spotted the fire and led the horses to safety. Nobody was hurt. Mr Cumani thanked the fire crews via Twitter for their "incredibly quick response and effective action". Melbourne Cup hopes Mount Athos and Quest For Peace are among the horses in the care of Mr Cumani, who has owned the stables for more than 35 years. He has had success around the world, including two Derby victories at Epsom. 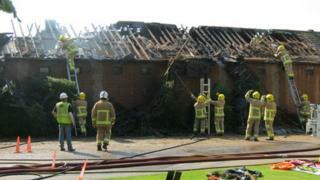 The fire is thought to have started in the roof of the 30m long stable block. At 13:30 BST, Suffolk Fire Service said the fire was ongoing but was "surrounded".